one of the things i love most about the christmas season is the sounds :: the music, the movies, the excited voices of little kids, the ripping of christmas wrapping paper, and the bells. oh, the bells. you hear them in the background of almost every christmas song and there are even songs written about the bells themselves. we have bells hanging on all of our doors and i love when someone opens the door and you can hear the bells ring. 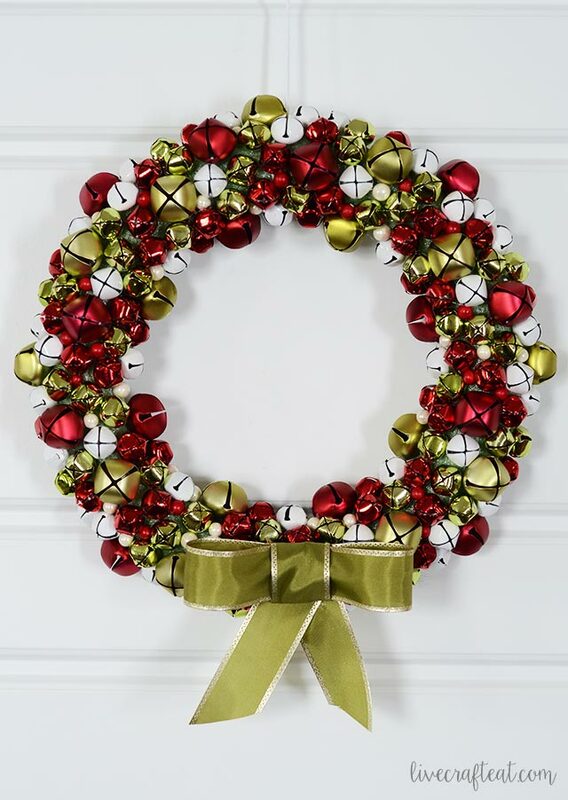 so much so that i wanted to make a jingle bell wreath to hang on our front door – it not only looks pretty and festive with the red, white, and green colors, but it sounds like christmas too! 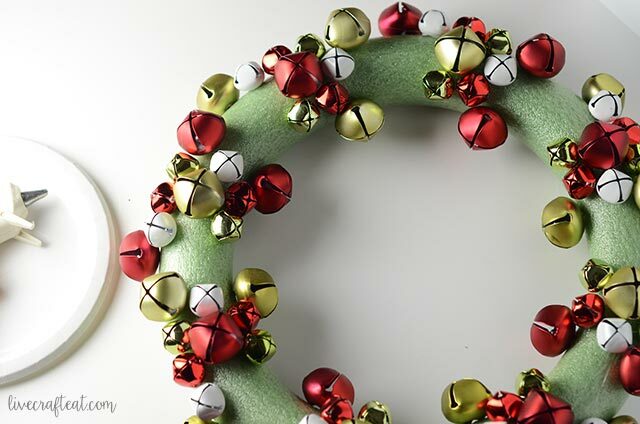 putting together a jingle bell christmas wreath is really easy to do. 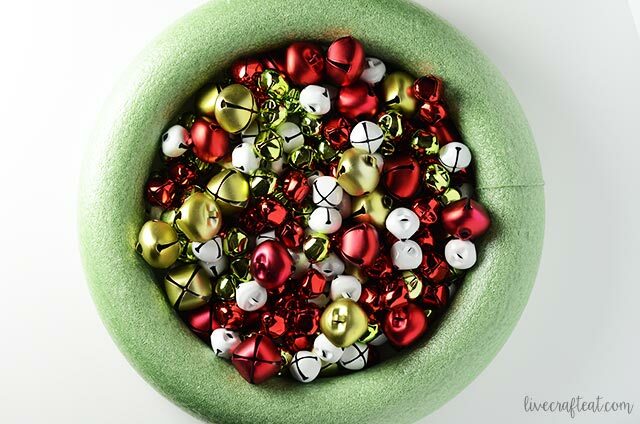 and you can customize it however you want: big bells, little bells, some of all sizes, multi-colored bells, or monochromatic, big wreath, little wreath, and so on. i went with a 12″ foam wreath base and a whole bunch of medium-sized (1-inch) and small-sized christmas colored bells. i got mine at michaels (they were 50% off!) but they are really similar to these 1″ bells and these 1/2″ bells you can buy online (aff links). the wreath form i found just so happened to be green so i left it as it was, but if yours doesn’t match the color scheme you’re going with you can always spray paint it to match. 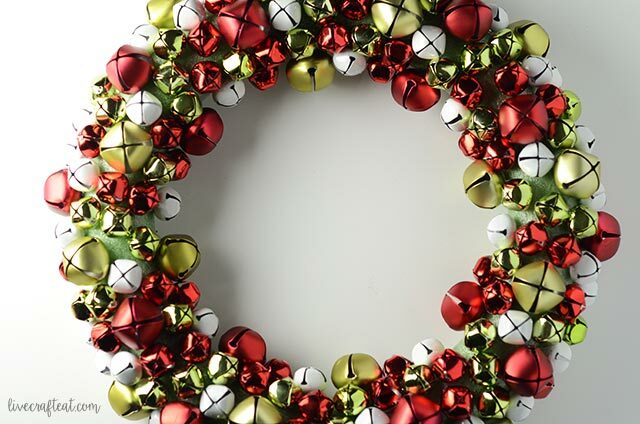 i found a 12″ white foam wreath form online here (aff link). you will almost always see little tiny bits of the wreath form showing from between the bells, so make sure it goes with the look you’re trying to achieve. 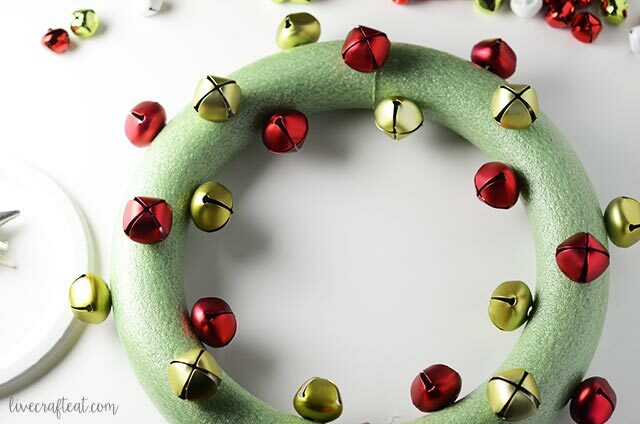 the only things you’ll need other than the bells and a wreath form are a hot glue gun and ribbon for adding a bow and/or hanging. you can also use a hook to attach to your door and hang the wreath directly from it. i started by gluing the medium-sized bells around the front of the wreath. 2. then i glued the same size bells around the outside and inside of the wreath, making sure i didn’t have any same-colored bells next to each other. 3. after that it was just a matter of filling in the rest of the space with the smaller bells. if you look closely you can see the sort of pattern i was doing with the smaller bells. 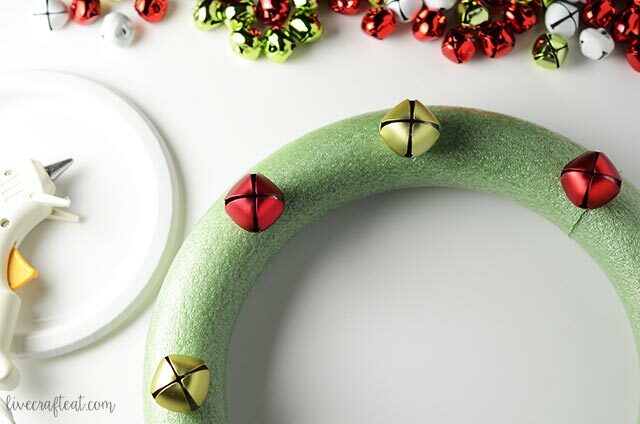 4. keep going until your wreath it as full as you can make it! if you have spaces that won’t fit another bell but are too big that they bother you, you can always buy little tiny plastic or foam berries or beads to glue in those places. look how beautiful it is! picking it up and hearing all the bells jingle just makes me happy! add a bow if you want, and look how pretty it is on the door! i love the way it sounds whenever someone opens the door. it just sounds like christmas. i hope you felt inspired to make your own jingle bell wreath so you and your family can enjoy the sights and sounds of the christmas season! to learn how to make an edible candy wreath, make sure to visit my candy christmas wreath post, here. 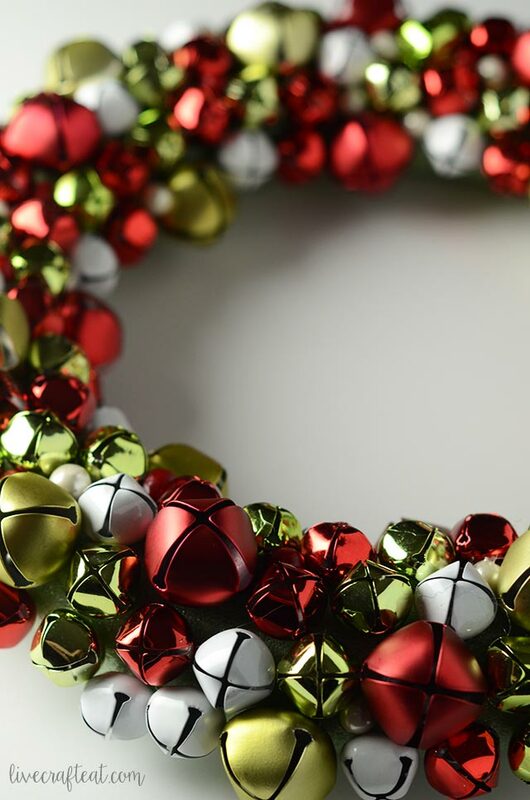 if you like this jingle bell wreath post, make sure you save it for later and/or share with friends by pinning it! Did you apply the glue to the bell or styrofoam? Seems like the heat might melt the styrofoam. For the most part I just glued the bottom of the bell and then adhered it to the wreath form, but on occasion I put it right on the form and didn’t have a problem with it melting. Katie, how did you glue the small ones on between the large and medium bells? Tweezers? Just lots of hot glue! The little bells I got were the perfect size to squeeze in between the larger bells. But tweezers would probably make it easier!